Eight leading scholars have joined forces to give us the most comprehensive book to date on the history of African-American religion from the slavery period to the present. 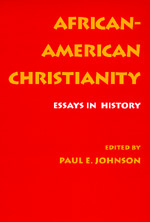 Beginning with Albert Raboteau's essay on the importance of the story of Exodus among African-American Christians and concluding with Clayborne Carson's work on Martin Luther King, Jr.'s religious development, this volume illuminates the fusion of African and Christian traditions that has so uniquely contributed to American religious development. Several common themes emerge: the critical importance of African roots, the traumatic discontinuities of slavery, the struggle for freedom within slavery and the subsequent experience of discrimination, and the remarkable creativity of African-American religious faith and practice. Together, these essays enrich our understanding of both African-American life and its part in the history of religion in America. Paul E. Johnson is Professor of History at the University of South Carolina and the author of A Shopkeeper's Millennium (1978).